For young people nowadays, the generation with no experience farming, even if they have farmland and can’t find a job, they’re still not willing to try their hand at agriculture. […] In my experience, after wandering far from home for many years, it was only by returning home to Wukan that I could feel secure, like a boat coming into harbor. That may be why young people played such an active role in Wukan’s land struggle. In December 2011, as “occupiers” throughout the US were being kicked out of their sleet-encrusted tents and the Arab Spring was just beginning its uncertain slide into Autumn, a few thousand “farmers” in a Chinese fishing village made headlines across the world. Had mainland China finally joined the global movement of the squares? Small demonstrations in American cities attempted to enact this fantasy of transnational connectedness. And in some ways, the Wukan Uprising did follow a trajectory similar to simultaneous movements elsewhere, such as the Tunisian and Egyptian revolutions: police brutality against peaceful protestors gave rise to a mass movement, whose militant actions soon outpaced the initially moderate demands, and whose political success (“overthrowing the regime” and electing new leaders) ended up failing to resolve participants’ immediate economic grievances, not to mention foreclosing more radical possibilities that emerged during the movement. But this similarity reflects a deeper level of transnational commonality that observers have missed: the state’s decreasing ability to meet economic demands due to the global recession and its underlying crisis of reproduction. In 2011, many observers believed China was an exception to the rule, but now it has become apparent that the crisis was already brewing under the surface. Local governments such as Wukan’s had been desperately selling villagers’ collectively-owned land in order to pay off debt for stimulus spending. This commonality has been obscured by the way Wukan and similar struggles have been represented as the resistance of “farmers’” to the seizure of land they farm as a primary source of income or subsistence. Looking more closely, we discover that most of these villagers primarily live and work in cities, do not even know how to farm, and aim only to increase the monetary compensation for the use of their land by commercial developers. As such, these recent struggles bear more resemblance to anti-austerity mobilizations over the social wage in Europe and North America than to classic peasant land struggles—including those so fiercely fought by some of the same Chinese protagonists and their parents in the 1990s. At the same time, the subjects of these recent struggles cannot be reduced to specimens of a homogeneous global proletariat or “multitude.” The Chinese proletariat itself is deeply divided between urban and rural hukou (household registration), and ruralites are in turn fragmented by a range of differing material conditions. These conditions cannot be understood without investigating their historical background—a background of agrarian change that has been central to Chinese modernity in its late-imperial, Republican, socialist and post-socialist guises. What Remains of China’s Peasantry? Many of China’s rural struggles since the mid-2000s—including many of the land conflicts accounting for 65% of China’s 180,000 “mass incidents” in 2010—have acquired the character of negotiations over the social wage. While almost all of these conflicts have remained localistic and narrowly-defined, their participants’ more proletarianized conditions, and the greater dominance of global market forces in even remote villages, may be increasing the material possibilities for such mobilizations to link up with the ever-brewing strikes and riots that periodically disrupt the urban areas where most of these “peasants” now live and work. In a broad sense specific to China, “peasant” could indicate anyone with a rural hukou, who will be referred to here as “ruralites” to avoid confusion. Many ruralites live in urban areas most of the time and are often uncertain whether they will settle there or eventually return to their villages. The hukou system is similar to apartheid or national citizenship, excluding ruralites from certain rights enjoyed by urbanites (people with urban hukou), but also granting ruralites the right to use collective village resources such as farmland, forests, ponds, coastline and pasture. In 2012, such ruralites accounted for between 60 and 70 percent of China’s population, totaling some 800 to 950 million people. Roughly 280 million of those ruralites are urban residents, in that they spend most of their time in urban areas, mainly working for wages or running small businesses. In classic sociological definitions, “peasant” refers more specifically to multi-generational households (not their individual members, who may occupy various class positions throughout their lifetimes) with access to small plots of land used for production with household labor, primarily for direct use, in addition to surplus for sale, rent and/or taxes. According to such definitions, peasants are not capitalist farmers because they do not use their land as capital or run their “farms” as enterprises. Nor are they are fully proletarian, since they have access to means of subsistence and use it for household reproduction, often in addition to some surplus production. At the same time, they are often semi-proletarian, since they depend partly on the wages or informal income of one or more family members. In this sense, China’s peasants number much less than the 900 million ruralites, although some sociologists argue otherwise. While the latter sense of “peasant” accurately described the conditions of most rural household in the period of post-socialist transition (1970s-1990s), this category has become less helpful since the 2000s. The increasing dominance of global market forces has transformed ruralites’ remaining land from a means of production to mere “welfare fields” (fulitian), as Chinese intellectuals and policy-makers put it—some arguing this collectively-owned land provides a temporary supplement to China’s austere social security system until the state is rich enough to afford “Scandinavian-style social democracy.” Although elderly ruralites still farm this land, their households and what remains of their village communities have become dependent on other sources of income. At the same time, those sources are becoming more precarious as China joins the global trend of deindustrialization. China’s rural population is thus being proletarianized at the same moment that it is being rendered surplus to the needs of capitalist accumulation. Meanwhile, the Chinese state is attempting to avoid the destabilizing effects of uncontrolled urbanization and peri-urban shantytowns. The hukou system—including the access to welfare fields it legally provides to ruralites—thus fulfills the dual functions of externalizing the costs of reproducing labor-power onto “peasant” members of rural families and helping to manage a population increasingly superfluous to the market economy. Although the hukou system is no longer as important as it was from the 1960s through the mid-2000s, it still divides the Chinese population. In its negative capacity, the system continues to disadvantage urban-dwelling ruralites with regard to social services, and the police may send them back to their villages at any time (rarely enforced these days, but still a card that can be played in times of conflict). In its positive capacity, a rural hukou entails the right to use a share of the village’s collective resources. While this right helps to manage the surplus population and externalize the costs of reproduction, individual investors and local governments are nevertheless driven by the profit motive and mounting debt to undermine these stabilizing functions through predatory practices such as land grabs—pushing ruralites to defend that right or, increasingly, to simply cash in on what has been lost. d. a portion of government taxes and fees converted into capital through investment in for-profit “collective” enterprises (until the mid-2000s reforms abolished rural taxes and fees). d. rent for farmland (unusual in China since most peasants farm their own land, but it is becoming more common for companies to lease land from villages and then sublet it back to the villagers or poorer peasants from elsewhere. It is also common for ex-peasant landlords in rich coastal areas such as Guangdong to lease their land to poor inland peasants for commercial farming). 3. And certain family members are exploited during certain periods of their lives through the wage relation, affecting the whole household to the extent that it depends on remitted wages. To these should be added the general sense in which everyone’s lives are shaped by commodity relations, so that those without sufficient money are excluded from the things they have been made to need or desire—exclusion that is defended by state force. For those ruralites unable or unwilling to obtain enough cash by farming, wage-labor or legal business, the most salient way they experience life under capital may be non-economic, via police enforcement of property relations and social order. In prison, some of these may then contribute directly to accumulation through forced labor. 1. Against direct expropriation, they petition higher authorities and carry out blockades, riots and occupations of stolen land and government buildings. 2. Against “unequal exchange,” they form co-ops (for finance, farm supply, processing and marketing) and create alternative marketing networks. 3. In the wage relation, workers from rural households negotiate or petition authorities and, when that fails, turn to strikes, slow-downs, sabotage and riots. 4. Against exclusion, ruralites may resort to criminal activities, occupy spaces to use for living, begging or vending, and occasionally riot. The current character of rural resistance has its roots in the socialist era. This cycle of struggle begins in 1959, the first year of the Great Leap Famine, when a rupture occurred between peasants and the Chinese Communist Party (CCP), which had developed widespread support in the countryside to various degrees over the previous three decades. Many members and even leaders of the party came from the peasantry, and the CCP’s guidance had proven successful at winning struggles against local elites that poor peasants had already attempted unsuccessfully on their own. Peasant support grew throughout the 1950s as CCP policies (such as land reform and cooperativization), coupled with the end of civil war, led to improvements in living standards. The post-Leap retreat to more conservative agrarian policies (partial decollectivization, restoration of markets) mitigated peasant unrest, but the damage was done. Henceforth it would be more difficult to mobilize peasants for mass campaigns or even everyday work. The inefficiency that Dengists and liberals alike attribute to the nature of collective production in general actually stemmed, in this case, from peasants’ resistance to state extraction and what they interpreted as alien, often irrational attempts to control the production process. In the 1970s (following more moderate recollectivization in the mid-1960s), many peasants again pushed for partial decollectivization, and others welcomed the Dengist state’s forced decollectivization in the early 1980s—less because of peasants’ inherent individualism or “petty bourgeois mentality,” and more because they wanted less extraction and more control over production. The early 1980s was a golden age for most Chinese peasants, comparable to the 1950s in optimism and surpassing it in terms of livelihood. Several decades of peace and gradual improvement of food intake combined with post-1968 improvements in rural health care managed to double life expectancy between 1949 and 1980. Meanwhile, two decades of collective projects to improve rural infrastructure (bringing new land under cultivation, expanding irrigation systems, building roads, etc.) and state modernization of agriculture (mechanization, production of agrochemicals and high-yield varieties of seed and livestock) finally came to fruition in the late 1970s. This was coupled with the first significant state increase in prices for agricultural products, supplemented by subsidies for peasant entrepreneurs who reorganized their household farms and privatized collective equipment to specialize in certain commodities, leading to the most rapid increase in agricultural productivity and income that China had seen since the Ming Dynasty—especially for those able to benefit from the entrepreneurial subsidies available from 1978 to 1984. By the mid-1980s, however, a combination of new factors caused these increases in productivity and income to decline. The increase attributable to modernization on tiny plots of land soon reached its limits. The state then decreased its subsidies and price controls for agriculture as part of its general strategy of marketization, and in order to balance the budget and lower the price of food for urbanites. These changes spelled disaster for peasants who specialized in certain cash crops when prices fell below the cost of production, leading to the first significant round of peasant unrest in China since the Great Leap Famine, beginning in the late 1980s. There is little data available on this sequence of struggles due to media censorship and the preference of researchers to focus on either decollectivization or anti-corruption struggles, but it is memorialized in Mo Yan’s novel The Garlic Ballads. Based on news reports and interviews, the novel recounts a 1987 uprising against the falling price of garlic and the government’s refusal to buy the surplus, after local officials had encouraged peasants to specialize in garlic and then pocketed the state subsidies, alongside fees they had charged for farming a cash crop instead of grain. If this case is any indication, the marketization of agriculture at this time was already intertwined with local state corruption, which became the focus of peasant resistance in the 1990s. It was during this period that many young peasants began migrating to coastal cities for temporary jobs, incentivized by expropriation in the countryside and increasing employment opportunities in the Special Economic Zones, both occurring just as returns from modernized small-plot agriculture had reached their limits. The struggles of peasants thus bifurcated into the rural struggles dealt with here, and the struggles of ruralites as proletarians, including conflicts in the wage relation and riots against social exclusion discussed in “No Way Forward, No Way Back” (also in this issue). 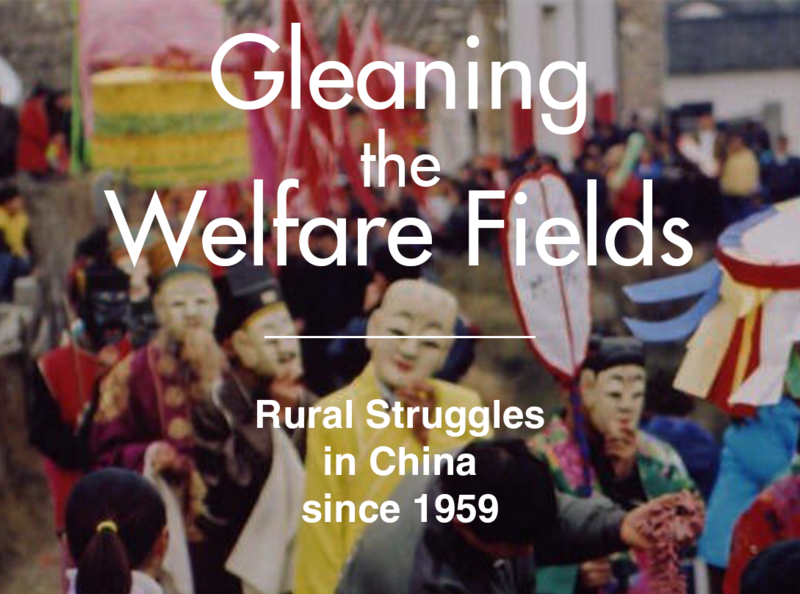 Despite frequent news reporting and a sizable academic literature, the only attempt at a comprehensive history of rural struggles in China since the 1980s is a pair of articles by Kathy Le Mons Walker published in the late 2000s. The following sections center on summarizing information from those articles, supplementing it with other sources and engaging critically with Walker’s analysis. the issuing of IOUs in lieu of payment of cash for crops by local officials, who used the funds for speculative real estate and business deals[…]; cadre diversion of state-allocated inputs for agriculture; the pocketing of TVE [“collective” township and village enterprise] profits by local and mid-level cadres; the imposition by local cadres of a host of ‘illegal’ or ‘unaccounted for’ fines, fees, and taxes to pay for ‘development’ projects and/or for personal use; the forcible confiscation of the land, belongings, and food of peasants who could not or would not pay the extra taxes and fees; the expropriation of arable land without adequate compensation (for highways, real estate development, and personal use, or to attract industrial investors through the creation of ‘development zones’); the issuing of inferior and fake chemical fertilizers, pesticides, seeds, and other supplies by corrupt cadres; and finally the pollution of local water supplies by development projects, which has not only angered peasants but affected agricultural production as well. This expropriation was not mere “corruption,” as both the Chinese state and liberal critics usually describe it. In some cases it resembles proto-capitalist “primitive accumulation” in Marx’s classical sense, because it played a key role in the transition to capitalism. In others, especially more recently, such expropriation might be better understood as specifically capitalist “accumulation by dispossession” in David Harvey’s sense—Walker’s preferred category of analysis. It transferred products of peasant labor into capitalist enterprises and the infrastructure necessary for its operation. It also took the form of capitalist rents, as opposed to the tributary and socialist rents in rural China prior to marketization. Investment in this period often took the form of “collectively-owned” TVEs, but many of these functioned as profit-oriented joint-stock enterprises, while others were eventually appropriated by their managers or cheaply purchased by capitalists. During China’s reintegration into the world market in the 1990s, these privatized TVEs became the initial vehicle through which Chinese and transnational capital exploited local and migrant peasant-workers—the vehicle of their expropriation often becoming the source of their exploitation. In response to such unrest, Beijing gradually increased its efforts to implement the “villager self-government” policy announced in 1987. This referred to the democratic election of “village committees”—the lowest level of de facto government, previously appointed by the township (the lowest level of de jure government). At first, few peasants showed interest in these elections, seeing them as little more than a formality, but eventually the idea of village democracy helped Beijing to portray itself “as an ally and protector of peasant interests and, thereby, both potentially minimize opposition to its own policies and suggest that the real problem lay with local officialdom.” At the same time, central authorities attempted to regulate local state extraction as part of a campaign to “lighten the peasants’ burden.” In 1992, an “Urgent Circular” forbade rural officials from levying taxes and fees over 5% of the average local income. The next year, a new Law on Agriculture granted peasants the right to refuse payment of unauthorized levies. This containment took time, however, and was never total. Beijing’s posture of support for “rights-defense” combined with China’s increasing marketization and growing class antagonisms to generate some more militant forms of peasant action in the first few years after 1993. These were characterized by “greater militarization and an openly insurgent politics, including the formation of dissident organizations and paramilitary forces,” such as the Chongqing “Anti-Corruption Army of the People, Workers and Peasants.” This sequence seems to have peaked around 1997, when rebellions in four provinces, involving between 70,000 and 200,000 participants each, “attacked government buildings, took party secretaries hostage, burned government vehicles, wrecked roads, commandeered government cement and fertilizer, and in at least two instances seized guns and ammunition.” Another form some of the more militant rebellions took in the 1990s was “paralyzed” or “run-away” villages, “where local cadres were killed and the rural administration either ceased or turned wholly away from state extraction and policy implementation.” This seems to foreshadow the 2011 uprising of Wukan, but on closer inspection, profound differences between these two types of conflict reveal how much has changed about rural China within only one generation—changes engendered not only by capitalist development, but also by the second round of state responses to the rural crisis. In 2000, when the “deepening” of village democracy proved insufficient as a carrot of legitimacy to balance the stick of increasing repression, Beijing put forth a new “strategic line” to correct the imbalance between urban and rural development, announcing that “protecting peasants’ rights” had become a top priority. This shift tentatively began with a further reform of rural taxes and fees, culminating in their complete abolition by 2006. The same year, Beijing launched a broad rural development campaign called “New Socialist Countryside” (NSC) as the centerpiece of China’s 11th Five Year Plan. In practice, this campaign and the programs that emerged from it ended up facilitating the further expropriation of ruralites through their forced relocation to make way for construction projects and agricultural industrialization. However, another major aspect of NSC was unambiguously conciliatory: a wide range of rural subsidies and welfare programs, including social pension insurance, minimum living allowance, and increased state support for rural healthcare and education. This unfolding shift in the state’s development strategy coincided with China’s “third wave” of post-Mao intellectual debates and activism regarding the role of peasants in Chinese development. All three waves (the first centered on the decollectivization of agriculture in the early 1980s, the second on TVEs in the early 1990s) concerned questions such as: “Was the peasantry going to disappear, be integrated into a new Chinese capitalism, or form an excluded class, marginalized and continually disruptive?” At first most intellectuals framed the problem in terms of “the peasants’ burden,” limited to “excessive” taxes and fees caused by the corruption of local officials. Gradually more sophisticated analysis took shape, such as Wen Tiejun’s theory of the “rural problem in three dimensions” (sannong wenti): peasants, villages, and agriculture. According to Wen—a prominent figure among China’s post-1989 “New Left” intellectuals—the crux of this problem was the commodification of land, labor, and money after three decades of “primitive socialist accumulation” (industrialization fueled by state extraction of surplus from peasant labor), conditioned by China’s semi-peripheral position in the modern world. On this intellectual foundation emerged “New Rural Reconstruction” (NRR), a social movement viewed as an alternative or compliment to the party-state’s responses to peasant unrest. NRR sought to channel this unrest into “constructive” projects aimed at reversing the dissolution of village communities and the flow of young people into the city—projects such as peasant co-ops, alternative marketing networks, and “cultural” activities (performing arts troupes, old people’s clubs, etc.). While such projects have doubtless played a positive role for the fraction of peasants involved in them—increasing income and slightly mitigating ecological devastation through organic farming co-ops, for example—they have made little progress toward stemming the outflow of young ruralites, or reviving communities to which young people would be willing or able to return. Both NRR and NSC also responded to fears that China might be headed for a recession or worse following the Asian financial crisis of 1997, with growing instability in the world economy after 1999 and signs that China’s productive capacity was outpacing its effective demand. In addition to eliminating rural taxes and improving the welfare system, therefore, a major concern of new policies such as NSC was to increase rural consumption through means such as subsidizing rural purchases of household appliances and improving infrastructure, e.g. building and widening roads and transferring ruralites into more modern housing complexes, thus also freeing up land to be used for either capitalist agriculture or real estate development. The ongoing round of land grabs, which critics call China’s contemporary “enclosure movement” (quandi yundong), could be dated back to Beijing’s relaxation of land management policies starting in the late 1980s and the ensuing “frenzy over land enclosure” in the coastal Special Economic Zones such as Shenzhen. In the early 1990s, 90% of all FDI flowed into this new market for land, made available after local officials evicted peasants, leasing it out for industrial and commercial development. In the late 1990s, this “frenzy” spread inland due to the combination of accelerated urbanization, the development of China’s new real estate market, and Beijing’s increasing restrictions on rural taxes and fees, which pushed local governments to sell land as an alternative source of revenue. Land grabs began to eclipse other forms of expropriation as the latter declined following the combination of pro-ruralite state policies and the liquidation of other collective resources (TVEs, etc.) in the late 1990s and early 2000s. Peasant collective action thus increasingly focused on land conflicts. Some of these conflicts could be quite militant, but because land is owned collectively at the village level, they rarely spread beyond a given village, in contrast with the anti-corruption struggles of the 1990s. Likewise, as the central and local governments grew more savvy about implementing land grabs in ways that minimized resistance, and as ruralite’s lives became more focused on activities in the city, more of these struggles developed the character of negotiation over the price of land that most villagers wanted to sell anyway, as opposed to efforts to keep the land for peasant use and the reproduction of village communities. Local governments increasingly made use of criminal networks to do their dirty work, and Beijing “armed paramilitary troops with real rather than rubber bullets,” leading to more violent repression. In 2005, for example, in Shangyou Village, Hebei, “with the approval of local authorities, a construction contractor sent in 300 helmeted thugs armed with hunting rifles, metal pipes and shovels to remove villagers who were occupying land that had been seized by the local government.” The thugs shot over 100 villagers, killing six. Later that year in Dongzhou Village, Shanwei Prefecture, Guangdong, armed police were sent in to disperse a similar sit-in against the seizure of land and coastline to build a power plant, and the villagers allegedly responded by throwing Molotov cocktails. The police fired and killed between three and 20 villagers in what the media dubbed “the Shanwei Massacre” in reference to the Tiananmen Massacre of 1989. Paired with the 2007 regulation was a “red line” of 120 million hectares under which China’s arable land would not be allowed to drop, out of concern for food security. The previous year, however, the gradual abolition of most rural taxes and fees was completed, and this only further incentivized local officials to search for alternative, often land-consuming sources of income. Beijing attempted to compensate for this loss of revenue to local governments by increasing its budget allocation and merging offices to cut down on personnel, but these measures barely made a dent in the dominant trend. This pressure only increased as the massive local government loans began to mature, with debt totaling 2.8 trillion US dollars in 2013—forcing Beijing to set a $2.5 trillion cap on local government loans in 2015. These loans were themselves central elements of Beijing’s post-2008 stimulus package, launched after 23 million workers from rural areas lost their jobs in the financial crisis. Somewhat ironically, many local governments found a solution in Beijing’s own NSC campaign, also launched at this time with the goals of “lightening the peasants’ burden” and increasing their incorporation into the market economy by promoting rural consumption. Despite the broad variety of projects included in the NSC’s official guidelines, local governments naturally focused on aspects that could generate revenue (both legally and illegally), and the most lucrative has been the continuation of land grabs and real estate development—now framed as providing improved housing for ruralites, but often including additional housing for sale to rich urbanites, along with tourist resorts, factories, and capitalist farms or “co-ops” (all portrayed, of course, as ways to generate income for the villagers). Although Beijing continued to restrict land transfers and attempted to deflate the real estate bubble, land sales and taxes on property transactions accounted for something between 30 and 74 percent of local government revenue for most of the past decade (up from 10% in the late 1990s). This increased 45% in 2013, and is expected to increase further in the coming years as more government loans mature. The only exceptions will be the few localities able to benefit from the inland flight of manufacturing and the development of large-scale industrialized agriculture and resource extraction. Such schemes spread throughout China in 2010, and according to a 2011 survey of 18 provinces, 20% of ruralites were thus “forced into high-rises” (beishanglou). Workarounds such as this have enabled the “land grab epidemic” to not only continue but actually escalate since the reforms in the early-to-mid 2000s, alongside peasant resistance. According to a series of surveys conducted between 1999 and 2011, involving 1,791 rural households from 17 provinces, “There has been a steady increase since 2005 in the number of ‘land takings’ or compulsory state acquisitions,” affecting 43% of the villages surveyed and an estimated 4 million ruralites per year throughout China. “The mean compensation that the local government paid to the farmers was approximately $17, 850 per acre,” while the mean price at which government agencies sold the land to developers was $740,000 per acre—over 40 times what the villagers received. “When farmers are relocated or ‘urbanized,’ only a bit more than twenty percent gained an urban hukou or registration; 13.9 percent received urban social security coverage; 9.4 percent received medical insurance; and only 21.4 percent had access to schools for their children.” Zhang Yulin’s more extensive study gives an even higher estimate for the number of ruralites affected by land requisitions: 6 million per year, on average, between 2003 and 2013, up from 5 million per year in the preceding 12 years. Local authorities have become more savvy in their efforts to minimize resistance. They have, for example, begun spacing out land grabs over time, giving villagers shares in enterprises that occupy their land, and using the new market in land development rights to finance the construction of high-rises for villagers—which many ruralites prefer because they are more “modern,” although they usually require residents to switch from subsistence farming to buying most of what they consume, among other changes of lifestyle. Nevertheless, rural resistance seems to have also increased throughout this period, with 65% of 2010’s estimated 180,000 “mass incidents” involving conflicts over land, according to one widely-cited study. Little comparable data is available after 2010, but Zhang Yulin’s survey estimates 45,000-83,000 such incidents in 2011, “including several thousand cases of direct violent confrontations, followed by a death toll in the thousands.” This is up from 14,000-26,000 struggles against land grabs in 2003, and he described the trend as still increasing “with no end in sight” as of 2013. It is complicated to compare the above figures based on official records and more rigorous methodologies with data from Chinese microblogs, but the latter is the only source available since 2011. A group with the Twitter handle “Wickedonnaa” has been archiving online reports of mass incidents since 2013, and recently it calculated detailed statistics for 2015 in comparison with 2014. These actually suggest a decline in rural struggles relative to urban ones over the past few years, and an increase in environmental issues as a major source of rural conflicts alongside land seizures and officials’ embezzlement of public funds. Out of 28,950 recorded mass incidents in 2015 (up 34% from 2014), only 10.4% (3,011 cases) involved “peasants,” the main causes being land grabs, housing demolition, official embezzlement and environmental pollution or destruction. This categorization is tricky, however, since 9.1% of incidents are classed as “unknown,” some of the other categories include both urban and rural incidents or even overlap with rural land conflicts. More importantly, this data is skewed against rural incidents due to the digital divide: people living in cities are much more likely to post on microblogs. On the other hand, those rural incidents logged by Wickedonnaa involve hundreds of people on average, as opposed to less than a hundred for most urban incidents, and the police repression tends to be far more brutal. In any case, a decline in the proportion of rural struggles and diversification of their causes would be consistent with the decline of rural land available for seizure and the increasing orientation of entire rural households toward urban life and struggles. An Escalating Spiral of… What, Exactly? Walker portrays land conflicts since the mid-2000s as “an escalating spiral of violence and resistance” that “have had a more profound impact than tax and fee abuses” in that “the seizures destroy peasants’ livelihoods and basis for survival.” However, among the hundreds of thousands of rural land conflicts over the past decade, only a small and decreasing fraction opposed the land grab as such, and almost none have aimed to use the land for peasant farming. In the overwhelming majority of cases for which details are available, these were mere negotiations over the price of land that many residents had already abandoned, or in any case no longer regarded as their “basis for survival.” In some cases this might be explained as an index of peasants’ desperation in the face of state force often supplemented by thug violence: they may have preferred to keep their land, but felt that such a demand would have been hopeless, or much less likely to succeed than a demand for increased compensation. Several cases suggest the opposite, however. In the most extreme example, in 2011, peasants in Anhui petitioned the local government because their village authorities failed to appropriate their land: they felt cheated because those villagers who had lost their land received new housing and monetary compensation. It is significant that this was not in the outskirts of a major city, where most ruralites have already abandoned farming and the land has a higher value for industry or real estate development than for agriculture. This was in a relatively poor village where most households still supplement remission payments from migrant family members with farming for subsistence and sale. The development project was not related to urban expansion or investment, but was merely an effort by the village authorities to benefit from the NSC campaign by selling land development rights. The protesting peasants still valued their farmland as a supplement to their low and unstable incomes, but they would have lost only part of it in the development project, and they placed a higher value on the compensation. A more typical example involved two related conflicts in an even poorer and more remote village in a mountainous part of Guizhou (China’s poorest province), where almost all the young adults lived outside the village most of the time. The first occurred when the prefectural government built a highway through the village, connecting the prefectural capital with an old military airport being converted to civilian use as part of national project to develop the province. Many villagers, young and old, regarded the highway as a blessing, since they thought it would bring customers for roadside stores they could open, and possibly even factories in the nearby town, allowing villagers to work for wages without having to travel several days to coastal cities. However, as a few villagers were discussing the virtues of this new highway one afternoon, their neighbors suddenly called them over to a nearby hill in order to help stand in front of a power shovel—preventing it from excavating stone for use in the highway’s construction. It turned out that the villagers’ complaint was not against the highway in general or even the destruction of their land as such, but against the disturbance of this particular hill, which was believed to possess geomantic significance (fengshui). Several months later, when the local township government occupied much more of their land—including some of the hilly village’s already small amount of level farmland—to lease out for real estate development, the villagers sought only an increase in compensation (successfully, this time). One of the few recent conflicts where villagers opposed the land seizure as such was also China’s most widely-publicized rural conflict of the past decade, and probably one of the period’s largest uprisings of “farmers” (as most news reports put it): the 2011 uprising of Wukan Village. Wukan (population 13,000) lies in coastal Lufeng County of Shanwei Prefecture, Guangdong. Back in 2009, villagers had already begun petitioning the local and provincial governments when they learned that Wukan’s Village Committee (equivalent to a village-level government) had been colluding with the Wukan Harbor Industrial Development Corporation. The CEO was a Hong Kong capitalist and member of the Guangdong People’s Congress, its vice-CEO had been the party secretary of Wukan since 1970, and its general managers were also long-term members of Wukan’s Village Committee. Villagers alleged that these two overlapping entities had leased out 80% of Wuhan’s collectively-owned farmland for private development projects—including a hotel, luxury housing and an industrial park—without consulting the villagers since 1993, embezzling at least 700 million yuan ($110 million USD) that legally should have been split among the villagers, who received only 550 yuan ($87 USD) each. In 2009, a small group of young villagers—including migrant shopkeeper Zhuang Liehong (whose interview is included in this issue)—began to investigate what was happening to their land. They formed a group called the “Wukan Hot-Blooded Patriotic Youth League,” printing membership cards and taking oaths “to lead a moral life, love one’s country and fight for democracy and justice.” Between 2009 and March 2011, they submitted at least three petitions to the county government and six at the provincial level, never receiving a reply. They made videos about their investigations and petitions, attempting to generate support among fellow villagers. [The construction workers] said they were working for [Country Garden, a major private real estate developer] and that the land had been sold to them. It was the last and largest piece of land remaining in the village…. [We] went back to the village to prepare posters to start a protest…. Soon, the gong used for each clan to convene villagers was struck for the first time in the last 40 years. The next day, a few dozen villagers marched to the county government headquarters (five kilometers away), and when officials failed to respond, young villagers began blocking roads, smashing buildings and destroying equipment in a nearby industrial park. Police responded by beating protestors with truncheons and arresting three. The following day, hundreds more villagers surrounded the police station, some with makeshift weapons, and fighting ensued with riot police and hired thugs, who severely injured protestors including a nine-year-old. In the midst of this tension, the county government asked the villagers to elect 13 delegates to negotiate their grievances. After two months of negotiations, the Wukan delegates felt that no progress had been made, yet the government announced on December 3 that “the conflict had already entered its resolution stage.” The same day, police detained Zhuang, who had been circulating a manifesto that many considered central to the movement. Villagers responded by capturing several officials and holding them hostage until Zhuang was released. On December 9, the Shanwei prefectural authorities intervened, announcing that they had removed Wukan’s two village party heads from their posts and temporarily frozen the land transfer to Country Garden. The same day, however, several Wukan delegates were seized by plain-clothed men in an unmarked van. Two days later, one of them—Xue Jinbo, a 43-year old butcher—died in police custody. The state coroner declared the cause of death to be heart failure, but family members who were allowed to view the body (but prohibited from taking pictures) said they observed signs of torture. As news of this spread over the next few days, protestors chased officials and police out of the village and blocked roads leading into the adjacent county seat of Lufeng. By December 14, a thousand armed police had besieged Wukan, disconnecting its water and electricity and blocking the flow of food and medical supplies. Villagers (partly with the help of journalists) nevertheless managed to sneak in and out, smuggling in supplies and attending protests in Lufeng. Finally on December 21, Guangdong’s Provincial Party Vice-Secretary Zhu Minguo came and met with Wukan’s sexagenarian protest leader, recently-returned businessman and party member Lin Zuluan. Zhu promised to release the detained protestors, recognize the democratic election of a new Village Committee, and facilitate further negotiation of the land deals. The police withdrew, the protestors dismantled their barricades, Lin was appointed as Wukan’s new party secretary, and the villagers independently organized the election of a new Committee on March 3, electing Lin as chair and other protest leaders to five of the six remaining positions. Ultimately, this new Committee failed to regain more than a fourth of Wukan’s stolen land, partly because some of the land had been used as collateral for bank loans by companies occupying the land. More significant here, however, is that when over a hundred democratically-elected village representatives convened to discuss the fate of their land later in 2012, most voted not to return the land its agricultural functions, but to leave it to its existing commercial uses and plans, the only difference from the status quo being that each villager receive an equal share of the rent—to which they had been legally entitled in the first place. The farmland had already been abandoned years before, except for garden plots used by the elderly. Most of the younger villagers still spent most of their time in the PRD working for wages or running small businesses, and a few actually worked at the hotel and factories that now occupied their land. The fact that a police siege could threaten Wukan with starvation after a few days should be a clue that this was not a “peasant village” in the sense of even partial self-sufficiency: almost all their food and other necessities were purchased from outside. Wukan’s only significant agricultural activity was commercial aquaculture, performed mainly by peasants from inland China who rented offshore fishery plots (yuwei) from the village collective. This conflict, therefore, cannot be understood as a struggle by peasants against the expropriation of their “basis of survival.” Neither, however, was it simply a dispute among landowners about how to divvy up the rent from commercial development. As Zhuang mentions in his interview, the decline of manufacturing in the PRD has driven many young villagers back to Wukan, where they’re trying their hands at aquaculture or “gnawing on the elderly” (kenlao), living off their parents as a temporary solution. The rent they should have received from their collective land thus represents a crucial supplement to their precarious prospects for maintaining a socially acceptable standard of living after burning through any money their households have saved up after two generations of labor migration. This helps explain why so many villagers still working in the PRD, who otherwise pay scant attention to village affairs, rushed back to Wukan and risked their lives playing active roles in the struggle. The return of villagers from urban areas to participate in a rural struggle, and the participation of migrant farmers from poorer provinces living in Wukan, mark rare instances of crossing the sort of divisions that normally limit the explosive potential of such rural protests. In addition, some reports described the Wukan Uprising as “the spark that set the prairie ablaze,” inspiring or encouraging at least three of the many rebellions in other villages and cities throughout Guangdong around the same time. Although Zhuang’s interview emphasizes why Wukan villagers decided against “uniting somehow” with other rural struggles (fear of more violent state repression), the very fact that they considered and debated this option points toward the potential of practical solidarity among rural and urban struggles in the future. One effort to link a rural land conflict with the purposively anti-capitalist actions of urbanites occurred in the 2010 movement to protect East Lake in Wuhan, Hubei. According to one report, in December 2009 the government of Wuhan secretly signed a long-term lease with the state-owned real estate development company OCT (Overseas Chinese Town) for 211 hectares, including 30 hectares of the East Lake Ecological Preserve, to the tune of 4.3 billion yuan—the most lucrative lease of the year for rapidly expanding Wuhan. The chief concern among online critics of the plan was the possible ecological consequences, since water pollution and algae outbreaks have been increasing rapidly throughout China in recent years, rendering half of China’s population and two-thirds of China’s rural population unable to access safe drinking water. […] Finally, critics are concerned about gentrification, as the development plan would transform the lake and its environs from a peaceful, clean place where anyone can enjoy the natural world for free […] to an expensive, noisy and artificial resort for the rich. Urban participants in this movement (including at least one self-described “anarchist” of rural background) said that they approached some of the 50 rural households still resisting only to discover that their goals were incompatible: whereas the urbanites wanted to prevent the development project and keep the lake as it was, the ruralites wanted an increase in compensation. They were not even willing to consider the option of keeping their land and houses. Most had jobs in the city and, even if some used part of their land to supplement their incomes by farming for household use, they valued this less than the money they hoped to obtain in return for giving up their land. Again, they may have preferred to keep their land if possible and were just doing what seemed most prudent in the face of state force. Also, it may be misleading to generalize from such examples. These attitudes are more prevalent in the outskirts of major cities, where most ruralites are no longer peasants and their land is much more valuable for real estate development than for agriculture. Some of the Wuhan activists had also established a social center in a nearby peri-urban village, and when they learned that the village was scheduled to be demolished for urban expansion, they asked villagers about the possibility of resisting and received responses similar to those in East Lake. Although these cases may not be typical of contemporary Chinese rural land conflicts in more remote locations (for which little details are available), they are at least representative of most conflicts on the outskirts of major cities and relatively industrialized areas. They also point to the difficulty of linking such localistic and narrowly-defined struggles with broader movements that might take on a potentially anti-capitalist orientation. Riots as Crucible of “Socio-Cultural Unity”? Walker’s account of recent land conflicts culminates in an argument that such struggles have played an important role in the emergence of a “shared class perspective” among “the rural poor, the ‘have nothings’, migrant workers, disenfranchised workers and urban poor.” She compares this to earlier periods in Chinese history (the 17th and early 20th centuries), when “sustained rural collective action—rooted in local struggles—developed on a transregional or even national scale” and “assumed the character of a movement” by forming “a unified discourse of dissent.” These earlier movements, however, were based on the shared relations of peasants to their exploiters or expropriators: a 17th century movement against bonded labor, an early 20th century movement against rent and taxes, and the 1990s struggles against corruption and land grabs. The indignation and anger of many rural residents regarding the growing inequalities of the post-socialist path have been echoed in recent years by the “eruption” of numerous large-scale societal outbursts. […] In 2004, for example, in the Wanzhou district of Chongqing […] where many rural residents had been resettled due to the Three Gorges Dam project—perhaps as many as 80,000 people “rioted” after a tax official brutally beat a migrant worker who had accidentally bumped into the official’s wife. […] Similarly in 2005, 50,000 migrant workers in Guangdong also “rioted” after a security guard killed a migrant youth accused of stealing a bicycle. If we take this phrase (“collective bargaining by…”) and replace “riot” with “occupation,” “blockade” or “kidnapping of local officials,” it might also be applied to many of the recent rural struggles. A key difference, however, is that the object of bargaining is not the conditions of work and life the participants hope for the future, but the amount of cash they can glean from the liquidation of their welfare fields, in the hope that it will keep them afloat as they jump into the sea of a rootless urban life: cashing in on the past vs. hoping for cash in the future. With such different goals, targets and temporalities (not to mention geographic locations), it is understandable that these two types of struggle have not linked up to form a socio-cultural unity—even when they are conducted by members of the same family. On the other hand, these two types of struggle reflect their participants’ common condition of growing superfluity to the needs of capitalist accumulation. As in both more and less “developed” parts of our deindustrializing world, this condition fragments the proletariat into multiple specific relations of expropriation, exploitation and exclusion, and multiple corresponding forms of struggle. This makes it more difficult for the various class fractions and their struggles to cohere around a hegemonic pole, such as the historical workers’ movement or peasant army. China’s post-socialist political horizon is thus defined by a multiplicity of unconnected struggles by people experiencing a shared condition of increasing precarity—like that of the Arab Spring and Autumn, or of the Euro-American movements of squares and riots. While it is clear that both rural and urban mass incidents have continued to grow in frequency over the past decade, there have been no well-known cases in which these two types of struggle have linked up or even resonated significantly with one another, except for the limited rural-urban connections seen in Wukan. This is because each type relates to capital in a qualitatively different way. However, as the global crisis and its Chinese manifestations become more caustic, wearing down people’s hopes for a better life in the city, it is possible that more Chinese ex-peasants will try fleeing back to their birthplaces to reclaim the welfare fields. At the same time, as Chinese agriculture becomes more industrialized, turning even some of the rural-dwelling ruralites from peasants into workers, labor struggles will emerge closer to home. Either of these developments might spark a hitherto unseen fusion between urban and rural struggles, granting a more expansive orientation to the still frequent and militant land conflicts. From “Revisiting the Wukan Uprising of 2011: An Interview with Zhuang Liehong” in this issue. On our use of the terms “socialist” and “post-socialist,” and on the role and conditions of the peasantry in China’s “socialist developmental regime,” see our article “Sorghum and Steel” in this issue. This dominance is illustrated, for example, by the effects of last summer’s stock market crash on peasant farmers: “Emily Rauhala, How farmers from rural China bet on the stock market and lost”, Washington Post, 29 August 2015. Two methods of calculating this number are explained here: “Woguo de noncun huji renkou daodi you duoshao?”《我国的农村户籍人口到底有多少？》, <http://blog.tianya.cn/post-14642-43522365-1.shtml>. This difference is more obvious in Chinese: “peasant” is nongmin and “(capitalist) farmer” is nongchangzhu—literally, the owner of a “farm” (nongchang). Nongchang refers only to capitalist or state-owned farms (hiring workers), never to those limited to household labor on land allotted by the village, referred to only obliquely as “fields” (tian). Peasant farming is thus not considered a commercial enterprise, although in most cases it now functions partly as such. In 2006, for example, He Xuefeng estimated that 70% of China’s population (900 million people) were still “peasant” in this sociological sense, predicting that this would not drop below 50% within the next 30 years. Discussed in “The Question of Land Privatization in China’s ‘Urban-Rural Integration,’” China Left Review , Number 1. “Deindustrialization” here refers to the secular decline in manufacturing employment related to increasing labor productivity, rising organic composition of capital, and saturation of markets. For evidence that this trend exists globally and even in China, see “No Way Forward, No Way Back” in this issue. On “the general law of capitalist accumulation” to generate a relative “surplus population” beyond even the role of “industrial reserve army,” see “Misery and Debt: On the Logic and History of Surplus Populations and Surplus Capital,” Endnotes 2, 2010. This is a term from the Marxian “peasant studies” literature. See, for example, Hamza Alavi, “Peasantry and Capitalism: A Marxist Discourse,” in Peasants and Peasant Societies, edited by Teodor Shanin, Blackwell, 1987. It is comparable to the Preobrazhenskian “price scissors” during the socialist era, except that it is determined not by state fiat but by the relative bargaining power of peasants vs. capitalists on these markets. This relation between peasants and capital differs from those among, for example, industrial capitalists, landlords, and retailers, in that it does not merely divide the profit extracted from wage-laborers in industrial production, but actually extracts surplus-value from peasant labor. For background on the Great Leap Forward and causes of the ensuing famine, see “Sorghum and Steel” (this issue); “A Commune in Sichuan?”, on the Chuang blog; and Eating Bitterness: New Perspectives on China’s Great Leap Forward and Famine, edited by Manning and Wemheuer, UBC Press, 2011. It was partly in response to this that the state re-instituted the hukou system in its current form in 1960 (after it had collapsed during the Leap). See Tiejun Cheng and Mark Selden , “The Origins and Social Consequences of China’s Hukou System,” The China Quarterly, Volume 139, 1994. pp. 644-668; and Manning and Wemheuer, 2011. Dengists—the followers of Deng Xiaoping and Liu Shaoqi, who contested Maoist policies throughout the 1960s-1970s and came to power in 1978, initiating China’s transition to capitalism in the name of “market socialism” – argued that collective agriculture was inherently inefficient compared to household-managed agriculture (based on collective ownership of land on a state-regulated market). Chinese and Western liberals alike go further in arguing that land should be privatized. Elderly peasants in Anhui, for example, have told us there would have been no need to decollectivize if the state had simply extracted less grain, offered higher prices, or allowed more control over farming. For an in-depth comparative study of these changes (which, despite the book’s title, is also critical on key points), see Chris Bramall, In Praise of Maoist Economic Planning: Living Standards and Economic Development in Sichuan since 1931, Oxford University Press, 1993. There was also peasant unrest during the Cultural Revolution (1966-1968) and its aftermath, but this seems to have mainly taken the form of localistic factional disputes. A few exceptions are addressed in Yiching Wu, The Cultural Revolution at the Margins: Chinese Socialism in Crisis, Harvard University Press, 2014. Translated by Howard Goldblatt (Viking Press, 1995). “‘Gangster Capitalism’ and Peasant Protest in China: The Last Twenty Years,” Journal of Peasant Studies, Volume 33, Number 1, 2006, and “From Covert to Overt: Everyday Peasant Politics in China and the Implications for Transnational Agrarian Movements,” Journal of Agrarian Change, Volume 8, Number 2, 2008. This is the more common line taken by Marxist observers, such as Michael Webber, “Primitive accumulation in modern China,” Dialectical Anthropology, Volume 32, Number 4, 2008. According to Harvey (The New Imperialism, 2003), “accumulation by dispossession” uses direct expropriation (instead of exploitation via the wage relation) as a way to decrease the cost of resources for capitalist production during periods of low profitability. It is a technique whereby capital tries to avoid the consequences of its own law of value (i.e. crisis and devalorization) by breaking or bending that law (i.e. by stealing or buying resources below their value with the aid of state force). It appears similar to “primitive accumulation,” but functions differently once capitalist production has become well established. In 1990s rural China, it could be argued that both forms of expropriation (primitive accumulation and accumulation by dispossession) were taking place. Since the 2000s, most rural expropriation might be better understood as accumulation by dispossession, or simply class struggle over the social wage. This framework, as practiced by Chinese peasants in the 1990s and early 2000s, is explored in Kevin O’Brien and Liangjiang Li, Rightful Resistance in Rural China, Cambridge University Press, 2006. By “paramilitary troops,” Walker is referring to the People’s Armed Police (武警). They are administratively separate from both the regular police system (under the Ministry of Public Security) and the armed forces (the PLA), and are primarily responsible for suppressing “mass incidents,” with riot police as one of their branches. We follow the convention of calling them “armed police,” since “paramilitary” could be confused with the peasants’ own paramilitary organizations, and it also implies a greater degree of militarization than they seem to have (compared with the U.S. National Guard, for example). In 1989 it was the PLA rather than the armed police that crushed the democracy movement. For details about NSC, see Kristen Looney, The Rural Developmental State: Modernization Campaigns and Peasant Politics in China, Taiwan and South Korea, Harvard University, 2012. Alexander Day, The Peasant in Postsocialist China: History, Politics, and Capitalism, Cambridge University Press, 2013, page 6. Wen Tiejun, “Centenary reflections on the ‘three dimensional problem’ of rural China,” Inter-Asia Cultural Studies Volume 2, Number 2, 2001. Day (2013) provides an analysis of such writings and their influence on both state policy and popular activism. On NRR, see Day 2013 chapter 6, and Matthew Hale, Reconstructing the Rural: Peasant Organizations in a Chinese Movement for Alternative Development, University of Washington, 2013. Zhang Yulin, “Land Grabs in Contemporary China,” translated on the Nao blog in 2014 and reposted on the Chuang blog. It may be more than a coincidence that Wukan Village is also in Shanwei, part of the non-Cantonese speaking Chaoshan region, which is poorer and more rural than the heavily-industrialized Pearl River Delta where most Chaoshan ruralites work. On Wickedonna.blogspot.com (which logs reports of mass incidents from the Chinese blogosphere), Shanwei yields an inordinate number of results compared to other parts of China. Ibid. In contrast with Walker’s generally materialist framework, here she adopts the term “wicked coalitions” from He Qinglian’s framing of expropriation as a moral matter rather a systemic function of capital’s need for expanded reproduction as China was becoming increasingly subject to the law of value. McBeath and McBeath, Environmental Change and Food Security in China, Springer, 2010, page 70. “China Places Cap on Local Government Debt,” Wall Street Journal, August 30, 2015. Liyan Qi, “Hard Landing Ahead for China’s Local Governments?” Wall Street Journal, March 1, 2013; Sandy Li, “Record land sales revenues leave local governments worried about further property curbs” South China Morning Post, January 10, 2014; Liyan Qi, “Swelling Debt Spreads Among China’s Local Governments” Wall Street Journal, February 14, 2014; “Worries grow as China land sales slump”, Financial Times, January 5, 2012. On land development rights and real estate development in the NSC framework, see Looney (2012), and Wang Hui, Ran Tao and Ju’er Tong, “Trading Land Development Rights under a Planned Land Use System,” China and World Economy, Volume 17, Number 1, 2009. Similarly, one 2013 news report claims that environmental protests have surpassed land conflicts as the “main cause of social unrest” in China, but this is based only on the comment of a retired CCP official, so must be taken with a grain of salt: “Chinese Anger over Pollution Becomes Main Cause of Social Unrest,” Bloomberg, March 6, 2013. In any case, both types of unrest have continued and perhaps increased over the past decade, and ruralites have played a major role in both. This event and others described below (for which no source is given) were witnessed personally. Over 500 came home—mostly from coastal Guangdong—after the financial crisis of 2008, but almost all of these found new jobs within the next year, many in the more rapidly developing smaller cities closer to home. “Wukan, Wukan!” is the title of a documentary film about this struggle, made by Zhuang Liehong and other villagers, discussed in the interview with Zhuang in this issue of Chuang. Our account here is based on that film and interview, conversations with an observer who visited Wukan during the struggle, and secondary sources, the most helpful of which are: Shenjing He and Desheng Xue, “Identity Building and Communal Resistance against Landgrabs in Wukan Village, China,” Current Anthropology, Volume55(S9), 2014; and Keegan Elmer, “Battle lines in the Chinese Blogosphere: Keyword Control as a tactic in managing mass incidents,” FIIA working paper, 2012. Since 1993, Lufeng has been officially designated as a “(county-level) city” (xianji shi) and Shanwei as a “(prefecture-level) city” (diji shi). We use the older terms because they more clearly reflect the administrative hierarchy. The change of terminology is significant, however, since it reflects the extent to which the area has urbanized over the past two decades, making Wukan a prime target for commercial development (along with the village’s location on the coast). Wukan is only 5 km away from Lufeng’s central urban area. He and Xue 2014, p. 130. Interview from He and Xue 2014, p. 130. Lufeng official news website, quoted in Elmer, p. 15. For example: Josh Chin “Wukan Elections the Spark to Set the Prairie Ablaze?” Wall Street Journal, Feb 1, 2012.. Elmer (page 27) found reports of 11 mass incidents in other Guangdong villages and cities around the same time, but is skeptical about connections among them. “The Battle for East Lake in Wuhan,” China Study Group, 2010. A typical example was the 2012 Foxconn workers’ rebellion in Taiyuan, described in “Revolt of the iSlaves,” Gongchao. On recent changes in Chinese agriculture pointing to this eventuality, see the Chuang blog post: “The capitalist transformation of rural China: Evidence from Agrarian Change in Contemporary China,” August, 2015.